As far as posters go, it is pretty generic. The main character is on it, with the exposition action sequence, title, credits, and release date seen within Hunt. But the action sequence looks to be pretty intense. That’s because the little guy dangling at the center of it is Cruise. 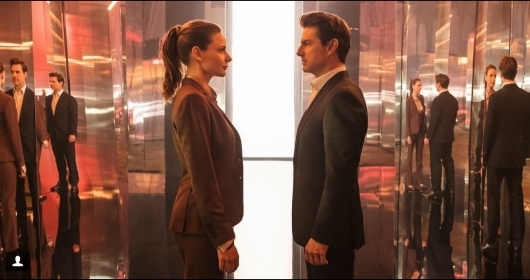 The Mission: Impossible films, as of late, are no stranger to death-defying stunts. Whether it is clinging on for dear life on the world’s tallest building, or clinging on for dear life while on the side of a plane, it looks like there is no stunt that Cruise will not try. As you can see, this time he will be dangling from a helicopter. Mission: Impossible – Fallout stars Cruise, Henry Cavill, Simon Pegg, Rebecca Ferguson, Ving Rhames, Sean Harris, Angela Bassett, Vanessa Kirby, Michelle Monaghan, Alec Baldwin, Wes Bentley, and Frederick Schmidt. It’s directed by Christopher McQuarrie. There is also a quick teaser for the trailer below. Of course, it’s all very fast-paced. But there is lots of danger that the IMF team must overcome, and of course the familiar Mission: Impossible theme that plays during the course of it. Both the teaser and poster appeared on Paramount’s official Twitter page. Mission: Impossible – Fallout opens in theaters on July 28, 2018. And be sure to check back here for the first trailer on Super Bowl Sunday, February 4, 2018.